Ever wish there was a magic key to unlock the mind of your typical customer? How wonderful would it be to step into their head and see exactly what they want, what they fear, and what’s preventing them from buying your products? Well, as great as that would be – or intrusive, depending on your perspective – I’m afraid you won’t find it in this guide. What you will find, however, is something almost as good. If you’ve ever wanted a rigorous and tested method to understand the “voice of the customer” in ecommerce, then you’re in the right place. You likely already know the importance of collecting customer feedback, but you might be unsure about establishing processes that drive clear, measurable improvements for your ecommerce store. By the end of this guide, you won’t be in any doubt about the importance of “voice of the customer”. In fact, we think you’ll be eager to start implementing the techniques and measuring your results. Just what is “voice of the customer” (VOC)? This guide has two goals. First, you’ll get a practical strategy for understanding the voice of your customer. Second, you’ll learn how to use this understanding to implement practical, measurable changes on your website. “Voice of the customer” is one of those business terms that everybody’s heard but few actually stop to properly define. It refers to both a detailed picture of your buyers’ psyche in regards to your ecommerce business and the process of creating that picture. Fundamentally, the process involves gathering detailed user feedback directly from customers and extracting qualitative data about specific needs and wants. In an ecommerce setting, this concept applies just as much to the buying experience as it does to the products themselves. Indeed, from a conversion perspective, what happens before the sale on your website can be even more important. Once confirmed, these buyer “characteristics” can be used in a variety of ways to better meet the needs of your customers and boost conversions across your site. They are especially useful when combined with quantitative data, often clarifying needs and problems you didn’t even know existed. “Voice of the customer” is based on qualitative data as opposed to quantitative data. Let’s take a quick look at those two terms. Qualitative data is data you can’t put a number on. It’s all about understanding customer psychology. It encompasses needs, preferences, fears, annoyances, expectations, temperaments, biases and so on. When you combine the quantitative demographic data (like age-group or marital status) of specific segments of your customer-base with a unique set of customer needs, qualitative data becomes incredibly powerful. You can use it to target specific groups of people with a clear, personalized package of solutions and benefits. Quantitative data is any type of data that is expressed using numbers. Demographic data is quantitative, as are any metrics about the performance of your site (ROI, sales, conversions etc.) or the behavior of your customers. As an online retailer, it’s easy to get stuck in the quantitative data trap. Numbers are easy to collect and use. They deliver concrete insights. They’re much easier to pin down than the ambiguous “VOC”. Quantitative data gives you a very thorough picture of what’s happening on your site. You can measure clicks, conversions, engagement, time-on-page and more. But what you don’t know is why your customers act in a certain way. This is where qualitative data comes in. While defining your customer voice can be abstract at times, the process of “voice of the customer” can yield incredibly robust insights into the minds of your customers. And this understanding will lead to definite action-points that will have a measurable impact on your quantitative key metrics. Most online stores have customer service recordings. In fact, they’re usually one of the most available sources of insights for building your “voice of the customer”. If you don’t already have the infrastructure in place for recording customer service interactions, it should be high on your list of priorities. There are a number of inexpensive ecommerce solutions and integrations that provide this service. The simplest way to use customer recordings is to extract specific questions and pain-points from them. These will give you a concrete outline of your customers’ concerns, fears and frustrations. Once you have a list, you can start to ascertain why customers aren’t finding a solution on your site. You obviously can’t listen to all the tapes or read all transcripts to build a complete picture of your customer base. In fact, you don’t need a large sample. At Growcode, we’ve found that only a 50 or so recordings, taken from a variety of customers, is usually enough. One of our clients, for example, ran a travel agency. 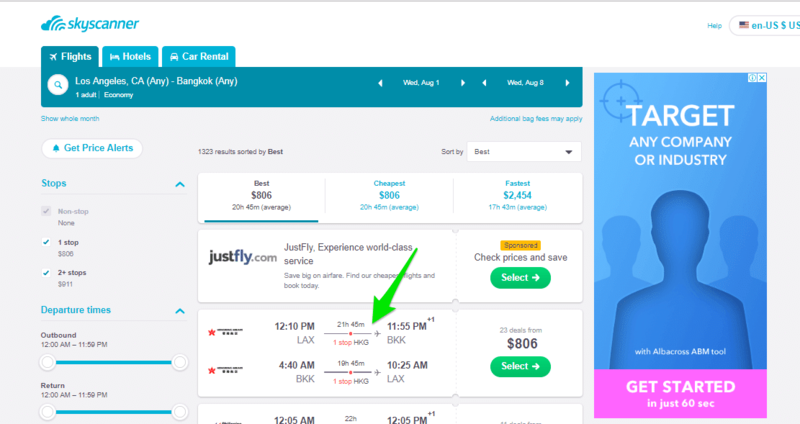 After listening to just two hours of recordings we were surprised to find that many customers were asking about the length of flights, information we had assumed was available on the site. In fact, what was available were departure and arrival times. We were able to add flight durations (not just departure and arrival times) and saw an immediate increase in conversions. After adding flight duration, such as in the example from SkyScanner above, we saw an immediate increase in ticket sales. This is the example of implementing ideas from customer feedback. It’s important to gather demographic data because you can use it to group together specific needs. This will enable you to design specific areas of your site to cater directly to these segments. In the aforementioned example of the travel agency, we found that a significant portion of people was calling in to ask about holiday options for couples. They wanted to know if there were hotels for couples, romantic itineraries, options for looking after children etc. We used this information to build a dedicated section of the site specifically for them. But if we hadn’t tied this diverse set of needs to a specific group, we wouldn’t have been able to offer a set of solutions as part of a single package. We’re talking about specific words and phrases here. The language your customers use is one of the best windows into their psyche. Mirroring it on your own site (and even your advertising copy) allows you to touch directly on customer pain points in a way they directly relate to and understand. Collecting this information is one of the best ways to discern your customers’ fears, uncertainties and doubts. By asking yourself “Which product features or benefit did prospective buyers find most convincing when interacting with sales?” you’ll generate a clear, specific set of highlights that you can use to boost sales across your whole site. Combining these insights with demographic data will allow you to communicate key benefits to the right people in the appropriate areas of your site. How can you put everything into action? As has already been mentioned, it’s important to select samples that represent your whole customer-base. It will be impossible to mine every recording. But even just two to three hours of listening to recordings every week can yield tremendous dividends. The added upshot is that you’ll also cut wasteful calls to customer service. What are the most common questions customers are asking? What are the biggest fears/concerns? How can customers be segmented? Are there any needs that are specific to certain segments? Which words do customers often use to describe their needs and our products/services? Which benefits appeal most to your customers? Regularity is the key here! Whether you intend to have sales/marketing process the recordings directly or brainstorm with your customer service team, consistency is the engine that will drive long-term improvements to your site. It will also allow you to build a complete picture of the voice of the customer, one that changes as your business grows and buyer habits and preferences shift. Email surveys are hands-down one of the best ways to gauge the satisfaction of your customers. Most online retailers will use surveys to some extent, even if it’s only to sporadically ask questions about a completed order or customer service experience. But email customer satisfaction surveys can achieve much more in terms of contributing to the voice of the customer. At Growcode, we’ve found that most of our clients are underleveraging this powerful technique. To fulfil your knowledge about collecting ecommerce feedback check out our episode of Bite-Size Ecommerce Optimization! What questions should you ask in an email? What are the 2 remaining strategies to hear the “Voice of Customer”? 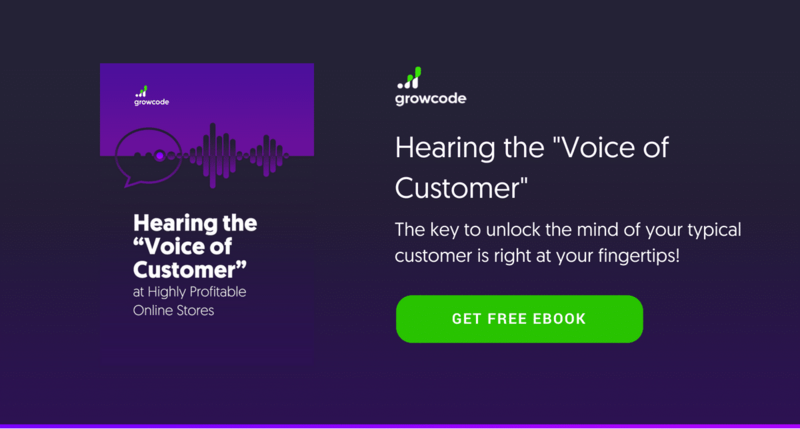 Find out by grabbing your free copy of our ebook: Hearing the “Voice of Customer” at Highly Profitable Online Stores! Growcode Ecommerce Blog / Ecommerce Optimization / How to Hear the Voice of Customer at a Highly Profitable Online Store?